It is not the collision of the tectonic plates that I am alluding to here or the drift of the continents nudging each other out, it is the mighty clash of dominant religions from the adjoining Continents. The religion of Islam from the East (the Middle East and North Africa) crossed over to the West in Spain and clashed for centuries for prominence. Spain was the battle ground of two dominant religions vying out for territorial gains. Islam from North Africa and North West of Middle East eyed Spain some twelve centuries ago as the gateway to Europe for religious expansion. Obviously, the dominant religion (Catholicism) of the region resisted and fought back and what happened during the next few centuries not only shaped Spain but also the whole of Europe. Recently I travelled to ‘Classical Spain’ with the Riviera Travels visiting places like Seville, Cordoba and Granada, among others, where Islam came, conquered and eventually beaten and relinquished the gains some centuries later in the face of relentless adversarial reaction from the indigenous religions. Our travel started when we landed at Malaga airport (a southern coastal city of Spain), when Riviera Travels grouped together tourists from Manchester and South of England and brought them through Manchester and Gatwick airports. We spent the night at a 4* hotel which was some 1100 ft above the sea level and hemmed in on the sloping banks of a hill overlooking the Mediterranean Sea. After a drink reception in the evening followed by buffet dinner where I came to know other tourists, I retired. Next morning, we travelled to Ronda, a small town on the outskirts of Sierra de Grazalema national park trekking a scenic route past Marbella (a holiday resort famous for night clubs) and on the way managed to have a glimpse of Gibraltar across the sea. It is surprising that for such a desolate rocky mountainous outpost, two countries went to battles a number of times over the centuries. We spent nearly five hours in Ronda, which is famous for bull fighting, in particular. It is claimed that bull fighting started in Ronda, but other cities like Seville and Madrid would dispute that vehemently. After having fantastic mixed tapas for lunch, we went to see the ‘new bridge’ connecting two hill cliffs over a gorge of some four hundred feet drop. The sound of cascading water in the gorge is soothing, but the sight of hundreds of feet of almost vertical drop is awesome. As I looked from the bridge down the gorge, I saw people trekking along the small stream meandering along the boulders, rocks and some tropical trees. Another three hours of bus trip took us to the famous city of Seville. After checking in at the hotel at the centre of the city, we went to have ‘tapas tasting’ at a local restaurant (given free for Riviera travellers) and then after the dinner, we went to see the famous ‘Mushroom Tower’. This ‘Mushroom Tower’ has a fascinating history. Some twelve years ago, Seville politicians had the bright idea of digging a tunnel across that area to construct a relief road. As they dug, they started getting more and more Roman artefacts and then they found a Roman burial chamber. Obviously, they could not demolish the Roman Remains for the relief road. They built an archeological museum on the burial site and a fantastic mushroom bridge towering over the surrounding areas (some three hundred feet above the street level) had also been built. The site now is a major tourist attraction. Seville is a place bristling with numerous historical and cultural monuments from both Islam and Christianity. The next morning, we had been taken by a bus to have a whirlwind tour of the city – so that afterwards we could go and see individual attractions at our leisure. We saw Seville Cathedral with the Giralda, Alcazar palace, the bullring and then we walked through the Maria Luisa garden to Plaza de Espania (half-crescent palace). Seville Cathedral (Spanish: Catedral de Santa Maria) is a Roman Catholic cathedral. It is the third largest cathedral in the world (after the St Peter’s cathedral in Rome and St Paul’s cathedral in London). Seville was conquered by the Umayyad in 712 AD. The Almohad caliph Abu Yaqub Yusuf decided to construct a grand mosque in the city in 1172 on the site where a mosque was built in 829 by Umar Ibn Adabbas. The grand mosque that was built was massive in size (15,000 sq.m. internal space) but it was not completed until 1198. Shortly after the conquest of the city by Ferdinand III, the grand mosque was ‘Christianized’ by converting it to city’s cathedral. In 1401, city’s leaders decided to build a massive cathedral on the site so grand that people would say after its completion that the leaders were simply mad. The work was not, however, completed until 1506! But some aspects of the grand mosque were preserved. The courtyard for ablution for the Muslim faithful was preserved. Now it is a long pool of water, some 15 ft wide, with fountains on both sides criss-crossing the pool and orange trees adorning it. Also, the minaret of the mosque (some 342 ft high) was kept, but converted into a bell tower, known as La Giralda, which is now the iconic symbol of the city. There are wide ramps, not steps, that lead up to the bell tower. The muezzin used to go up the ramps on horse back to the bell tower to carry out calls for prayers five times a day! The cathedral also contains Christopher Columbus’ burial site. Alcazar is a royal palace, built for the Christian king, Peter of Castile, on the site of an Abbadid Muslim residential fortress. The name Alcazar comes from the Arabic word al-qasr (the castle). The castle, with its extensive garden, was used as a royal palace by the Moorish rulers. It is still being used as a royal palace and, in fact, it is the oldest royal palace in Europe. In 1987 the cathedral, the adjacent Alcazar palace complex were all given the status of World Heritage Sites. In the evening, at 9pm, we went to the Flamenco performance. The gypsies from Southern Spain created the flamenco dance and music since their arrival at Andalusia in the 15th century. It is said that the gypsies came from a region of northern India called Sid, which is now in Pakistan. The folk-lore of Andalusia is conveyed by vibrant expressive dance, trapping of feet and the accompanying music. It was very entertaining. After spending three nights in Seville we headed for the famous Moorish city of Cordoba. We did not spend night in Cordoba, but spent the whole day there. We visited the Royal Palace, the famous Mezquita (mosque) and a museum. Cordoba, during the Moorish time, had the largest library in the world and the Cordoba University is reputed to be the oldest university (older than Oxford by centuries). After lunch we headed for Granada through the countryside covered with olive groves and absorbed the spectacular views of Sierra Nevada Mountains. We stayed in a hotel in Granada right on top of a mountain next to the Alhambra palace. Next morning we walked to Alhambra Palace and spent literally the whole day exploring various avenues and absorbing the lifestyles and traditions of bygone days. The history and tradition of Muslim rulers were conveyed to us by a local tourist guide. That the ruler would come in to one of the chambers (which chamber would not be disclosed previously for security reasons), sit on a high chair to give audience to the public is still being practiced by many Muslim leaders in many countries. (It is said that Sheikh Mujibur Rahman of Bangladesh practiced the same tradition). The following morning we went on a train tour (actually a bus shaped like a train) of the city, had lunch there and came back in time to board a bus to go back to Malaga airport. After the hectic seven days we headed back to England. If there is one person who embodies Bengal, Bengali language and culture that must be Tagore. Bangladesh was liberated from the yoke of Pakistan in 1971 as the land of Bangla (বাংলা) speaking people; not as an outpost of alien culture of Pakistan or Middle East. What started as the language movement, following the brutal killing of university students in 1952 demanding Bengali as a national language, eventually turned into ‘linguistic nationalism’ that culminated in the liberation of Bangladesh. For long 24 years, from 1947 to 1971, Pakistan tried to impose Urdu as the national language of Pakistan and obliterate Bengali language and Bengali culture from the indigenous population of the then East Pakistan. The leaders of Pakistan implanted and patronised Islamism in East Pakistan and that helped to evolve Razakar, al-Badr and many other factions of Islamist organisations during the liberation war not only to defeat the nationalist movement but also to wipe out Bengali-ness among the people. But they failed. These Razakars changed their guise, but maintained their ‘Muslim-ness’ as an opposition force against the dominant cultural identity of the people in post-independent Bangladesh. The ‘Muslim’ identity people might have retreated temporarily following the defeat of their patron, Pakistan, but they were not beaten. They kept reappearing, as and when opportunity arose, to undermine Bengali language and culture. The other arm of their strategy is to propagate Islamic culture as a replacement of Bengali culture. The proliferation of ‘hijab’, ‘niqab’ and ‘burqa’ among Bangladeshi women, the trend of inserting adjuncts like ‘bin’ or ‘bint’ (for men and women respectively) in names, increasing use of Arabic words replacing common Bengali words, all testify cultural invasion under the guise of religion. This twin strategy of undermining Bengali language and culture, and the import of alien culture had become apparent during the period of military rules in Bangladesh from 1975 to 1992 and then whenever Islamic-oriented political party, the Bangladesh Nationalist Party (BNP), often supported by the more overtly Islamist organisations like Jamaat-e-Islam, came to power. Of late, in anticipation of the BNP coming to power in the forthcoming national election at the end of this year, these ‘Muslim’ identity people at the behest of BNP are gearing up and attacking Bengali language and culture. This second group, despite Schendel’s branding it as “Bangladeshi-ness”, is a misnomer and gross misrepresentation. It should rightly be put under “Muslim-ness”, as they put Muslim as their prime identity and their country affiliation comes far below. They accept disgruntledly Bengali as the national language, but many of them would happily accept Urdu as the national language, which conforms to their Muslim identity. They are, in effect, the remnants of the Pakistani period. Bengali is one of the richest languages in the world. It is the direct descendant of Sanskrit, which is a Proto Indo-European language that has evolved over four millennia. That is why one can find similarities and resemblances between many Bengali words and Italian, English and Cyrillic words. 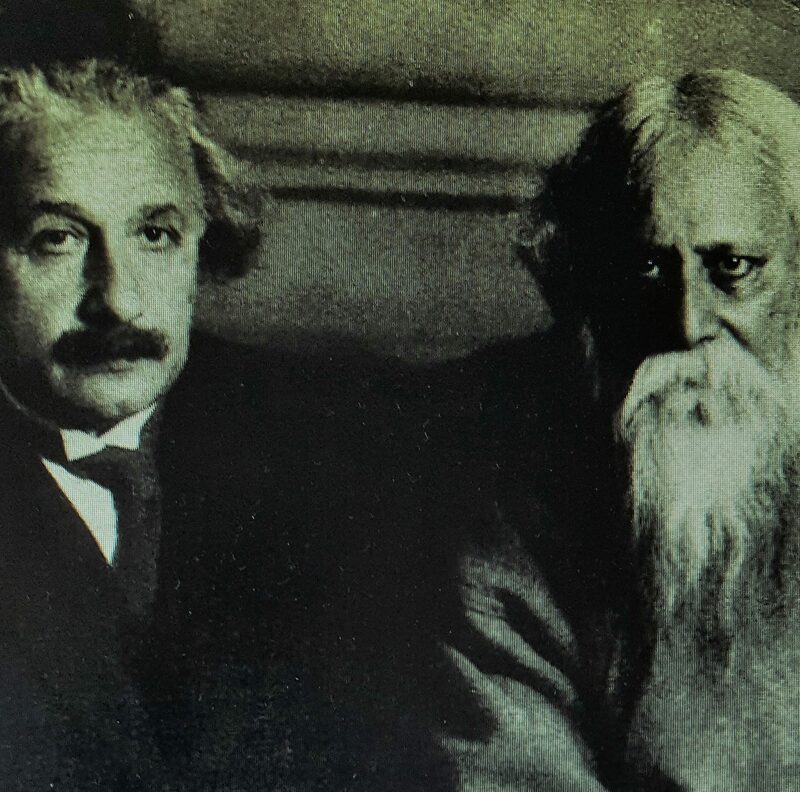 Of all the Bengali litterateurs, the person that stands out head and shoulder above the rest is Rabindranath Tagore, who was the poet, essayist, novelist, song writer and composer, playwright, philosopher and educationist. He was simply a literary giant not only in India but also in the whole world. He was the only person from Indian subcontinent who was awarded Nobel Prize for Literature (1913) and his songs are sung as national anthems in two sovereign States – India and Bangladesh. If there is one person who embodies Bengal and Bengali language and culture that must be Tagore. Although he was born in Kolkata, his ancestors were from Jessore in Bangladesh. Tagore married Mrinalini Devi who hailed from Khulna. Tagore spent more than two decades looking after the zamindari in the then East Bengal and spent extended periods in Shelaidah, Kushtia and Shahjadpur, Pabna and Petishar, Rajshahi. His poetic genius, his philosophy, his perception of life were all moulded by everyday lives of people in this part of East Bengal. He wrote many famous poems, songs, short stories while he was in the houseboat (called Padma) in Shelaidah and Shahjadpur. The most famous book of poems ‘Sonar Tari’ ( সোনার তরী) (The Golden Boat) was written in those days. He gave poetic expressions to occasions such as Bengali New Year (বাংলা নববর্ষ), welcoming rainy season (বর্ষাবরণ), spring festival (বসন্ত উৎসব) and so on that ripple through the hearts and minds of Bengali people the world over. Tagore felt very strongly for the plight of his poor Muslim tenants (প্রজা). One such occasion that had been narrated by Krisna Dutta like this: When he called a meeting of his tenants one afternoon, he noticed that Hindu tenants were sitting on mattresses and poor Muslim tenants were sitting on grass farther apart. He was cross at this segregation and asked his tenants that everyone must sit together on mattresses; if there were not enough space in the mattresses, everyone must sit on the grass. Quite often he would relieve his poor Muslim tenants of taxes and that did not endear him to his father, Debendranath Tagore. There is a concerted move by the ‘Muslim’ identity people – the Islamists and Islamist sympathisers – to denigrate Tagore by egregious falsification and trumped up stories. They branded Tagore as a plagiarist, a second-rate poet who attained fame only by British patronising. Needless to say, any attempt to counter such grossly egregious allegations is like going into the dirty gutters with them. Also, it had been said by those bigots that Tagore was anti-Muslim as, they assert, he wrote a number of poems praising Hindu culture and Hindu religion; he wrote none for Islam. That is quite frankly utterly ridiculous. As a Hindu (in fact he was a follower of Brahmo sect), it was quite natural that he would write about these religions; that does not imply that he was against Islam or Jain or Buddhism. Did he write anything against Islam? No. No. So, how on earth, could he be called an anti-Muslim or racist? Only one point that merits addressing here is that he had been accused of opposing the foundation of Dhaka University. He might have opposed it initially on economic grounds. It is also possible that he was not enthusiastic about it as he was in the process of setting up his own university at that time, which came into existence the same year that Dhaka university did. But, later on, he supported the Dhaka University when adequate financial provisions were made. He could not have opposed it strongly, as brazen Islamists claim, on grounds of race or religion, because in East Bengal in those days overwhelmingly large fraction (between 70 to 75%) of educated people primed to go to the university were Hindus. So, Tagore’s opposition to Dhaka University would have affected predominantly Hindus. The problem with semi-literate Islamists is that they think that he opposed Dhaka University because it was in Muslim-Bangladesh! How ridiculous! Syed Abul Maksud in his book ‘Purabange Rabindranath’ (পূর্ববঙ্গে রবীন্দ্রনাথ ) (Rabindranath in East Bengal) stated that Tagore had cordial relations with Muslims in East Bengal. The Muslim aristocrat of Dhaka, Nawab Sir Salimullah “paid rich tributes to the greatest poetical genius of modern India” in a meeting organized in the city on 26 November 1912 to celebrate his Nobel Prize award. Maksud also pointed out that Tagore was given a very enthusiastic reception by the Salimullah Muslim Hall Students’ Union of the University of Dhaka on the 10th of February, 1926 during his second and last visit to Dhaka. It may be pointed out that Dhaka University was founded only five years previously. (If Tagore had opposed it, then SM Hall students’ Union was probably unaware of it and now nearly 100 years later the brazen Islamists had found it out!) It should also be pointed out that the University of Dhaka awarded Tagore an honorary doctorate in 1936. To say that Tagore had opposed Dhaka university is totally disingenuous and dishonest. Also, the accusation that he was against Muslims has racist connotation. The ‘Muslim’ identity people are hell-bent on carrying out character assassination of Tagore and thereby undermine the very essence of ‘Bengali’ identity of the Bangladeshi people. The sooner these clandestine agents doing Pakistan’s bidding for ‘Muslim-ness’ are exposed, the better it is for the country.